If you have a machine ~ or other sewing supplies you have used ~ Please bring them. Sewing machine in good working order, basic tools (scissors, seam ripper, rotary cutter, stick pins, and neutral shade of thread). 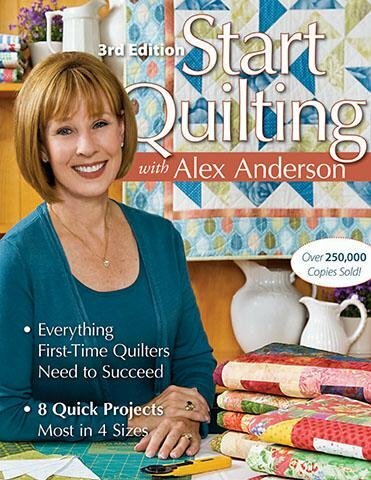 *We will be using the book by Alex Anderson, Beginning Quilting. This will be included in the price of the class. There is LOTS of information in this book! *Cost of the class will be $50.00 (includes book, fabric for 4 blocks) We will have fabric available from our scrap stash. If you prefer to bring your own, you are welcome to do so. *If you have your own basic tools please bring them. If you don't you welcome to use ours at the shop. That way you can "try them on" to see what is the most comfortable. *We will have informational handouts on threads, fabrics & more. *You receive a 20% discount on products for all our classes. We do have machines available to rent for $5.00 session.